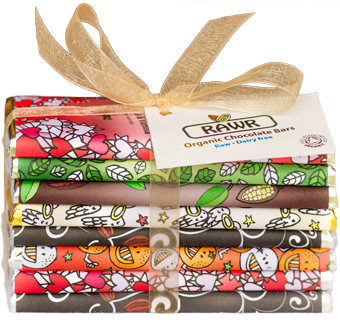 Design your own collection with two to eight of your favourite Rawr chocolate bars. The ribbon-wrapped collection is tagged with an optional gift message. Choose multiple bars of the same flavour, or completely different flavours, it's all up to you. Lovely for shipping as a gift! Rawr Chocolate has been my saviour when it comes to chocolate cravings. I adore the slight crunch of all the raw ingredients, and the taste really isn't much different to the dairy stuff that most people are used to. Amazing so gorg and caffine free and even better cacao i read after eating your bars that cacao can help boost fertility! Best flavours and best value raw choc I have found so far... I like the wrapping too.